I have been looking forward to summer vacation for MONTHS! JuHye and I booked a trip to the Philippines back in early May. We have been waiting so long to go that it almost feels unreal that it’s finally here! We met up on Tuesday evening in front of Paris Baguette to take the bus to the airport. The weather was rainy and gross so we were both excited to get out of Korea for a while. The four hour flight to Cebu was very smooth. We had seats in the exit row and that seemed great in theory, but the leg room wasn’t enough to make up for the fact that our seats didn’t recline. I can’t complain though. One of my favorite parts about the plane ride was that everything was in English! It’s amazing the great feeling you can get from something that simple. After being in Korea for 6 months, it was wonderful to be around other English speaking foreigners. We got into Cebu around midnight and then we had to go through customs. The line was long, but the process was pretty painless. We walked out of the airport to find a taxi to the hotel when I heard JuHye say, “That’s my name!” She kept walking and I was looking around to see what she was talking about when I saw a man holding a sign that said “JuHye Lee.” Upon further inspection, I noticed that the sign said the name of the hotel we had booked for the night. I said, “JuHye, that IS your name!” We had a free hotel shuttle service and we didn’t even know. It was great. The hotel we stayed at on Tuesday night wasn’t great. We booked something cheap and close to the airport because we knew that our flight didn’t get until late so we wanted to save some money. We slept with the window open and we woke up with the roosters. They have been crowing ever since. The room came with free breakfast, which was nice. The menu was pretty hilarious. It had breakfasts to suit every taste. There was the “Kim” that was a Korean style breakfast that included panjeon (seafood pancake) and rice. 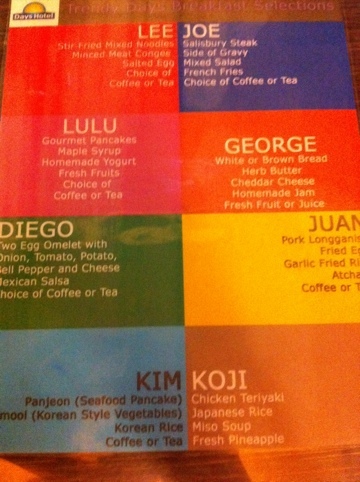 JuHye had the Lulu that was a pancake and fruit. I had the Diego, which was an omelet with salsa. There was also the “Joe” that had steak, gravy and french fries. Too funny. I am posting this from my phone at the restaurant at the hotel we are staying at. I’m not sure if the next hotel will have wifi so this may be the last post for a while.